Spring is here and the cherry blossoms are in full bloom to prove it. I am reminded, when I see all of the pretty little cherry blossoms, that soon I will be able to eat cherries. Unfortunately cherry season is one of the shortest as it only runs June to mid-July. 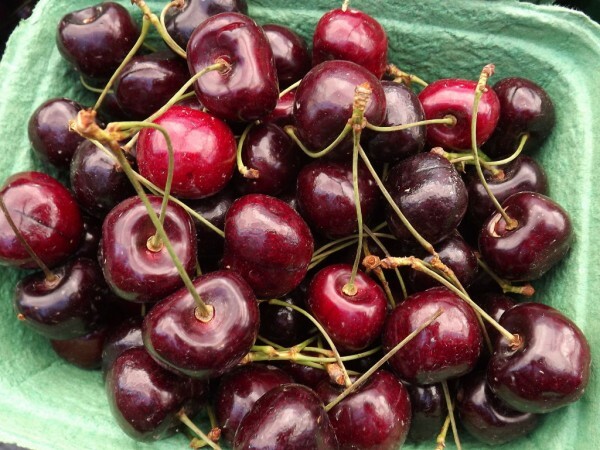 Not only do cherries have one of the shortest crop seasons, they are also one of the oldest cultivated fruit. They belong to the rose family and are distantly related to apricots, peaches and plums. Store cherries in the refrigerator, they will last longer. Remove the rotten or mushy cherries. One bad cherry spoils the rest. Use cherries as soon as they are ripe, as they ripen quickly. Don’t store the delicate fruit next to strong smelling food. It ruins the cherries flavor. To prevent the cherries from going bad avoid placing them in direct sunlight. For the cherries to last longer, wash them just before eating. Part of the long cherry history includes a book written in the third century B.C., called “History of Plants,” in which cherries are mentioned. Cherry history begins long before written history as cherry pits were found in caves from the Stone Age. The early pilgrims loved them so much that they brought cherry seeds with them to Plymouth, Massachusetts in 1628. Place the nuts, dates and coconut in a food processor and blend until fine. Add a teaspoon or more of water if crust does not stick together. In a pie or tart plate press the crust on the bottom making sure that it sticks together. In a high-powered blender place 1 cup of the cherries, coconut oil, coconut nectar and psyllium and blend until smooth. Place the reaming two cups of cherries in a bowl and pour the blender contents over the top. Gently mix them. Spoon the cherries onto the crust. Chill about 3 hours before serving and top off with whipped coconut topping. In the 1800s California become a major cherry production region. In fact the Bing cherry dates back from that time, which is the most popular cherry of our time. About 90 percent of the commercial cherry crop is grown in Oregon, Michigan, California and Washington. There are two types of cherries: the sweet and the sour. Generally when someone sits down to eat cherries they are enjoying the sweet variety. If a person is eating cherry pie then they are most likely eating the sour type. Cherries are high in melatonin, a natural way regulate the bodies rhythmic patterns. This means that they are good for people who have a hard time sleeping. A study found in the European Journal of Nutrition shows that people who consumed tart cherry juice in the morning and evening had a five to six percent increase in sleep efficiency. A study at University of Michigan shows the chemical composition of cherries and aspirin are similar. The sour cherry can be used as a natural painkiller and has been used in the treatment of muscle and back pain. They are also known for lowering uric acid levels in the body and have anti-inflammatory properties. Cherries are high in antioxidants and the darker the cherry color the more antioxidants it has. Sour or tart cherries are higher in nutrition than the sweet variety. It is time to think about and consume more red, cherry red that is. Whether you choose to eat them fresh, juiced, frozen or even dried, enjoy them because after all life is just a bowl of cherries. I love cherries! I found very interesting that they are similar to aspirin.